The years when kids are in elementary school are very important, in terms of setting the stage for a lifetime of good oral health. Baby teeth are replaced by permanent teeth, many kids are actively engaged in sports, and the sphere of influence in kids’ choices broadens dramatically. So let’s look at a few common issues that come up during this stage and are good topics of discussion with your children’s dentist. Out with the old…in with the new. Most people remember the excitement of losing their first tooth. This typically happens between age 4 and 7, when the lower central incisors push the baby teeth out. 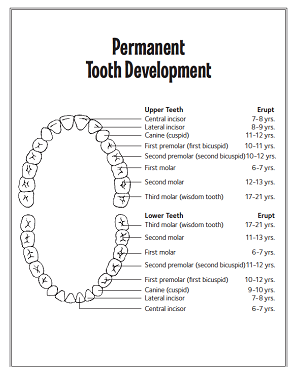 This chart from the American Dental Association shows the normal progression. Occasionally, a baby tooth comes out, prematurely. If that happens, a permanent tooth may erupt into that space, instead of where it’s supposed to be which can be prevented with a space maintainer. Maintaining a regular schedule of dental check-ups will enable us to keep a close eye on whether your child’s permanent tooth development is on track. An ounce of protection. Dental sealants are a thin coating applied to cavity-prone areas to protect baby teeth and permanent teeth from cavities. They form a barrier between the teeth and the bacteria which cause tooth decay. Occasionally, dental sealants need to be reapplied but generally, they are strong and durable, able to withstand the natural force of regular chewing. Be on guard. It’s great when kids develop a healthy lifestyle that includes lots of physical activity. Just as knee pads, shin guards, helmets, and goggles are an integral part of sports gear, so should a protective mouth guard. Mouth guards come in many forms, from a boil-and-bite one that you make at home, to those custom-fitted by a dentist. Research has shown that custom mouth guards provide much better protection against blows which can cause knocked-out or broken teeth, facial injuries, and even jaw fractures. We offer state-of-the art, affordable mouth guards and even offer them in a variety of colors, which definitely ups the “cool factor” while providing the best protection, available. Bracing for what’s ahead. Part of our regular dental care for kids is examining their occlusion, or “bite.” Early detection can help us detect issues such as crooked or crowded teeth, or jaws that don’t meet properly. This is important because these problems affect jaw development, tooth wear, susceptibility to tooth fracture, and speech. At Distinctive Dentistry, we take our roles as your family dentist and dental hygiene team, very seriously. We are passionate about providing optimal dental care to our patients of all ages. If you have questions about these or any other dental care topics, we’re just a phone call away!